$20 Minimum order - FREE Shipping on orders over $200! 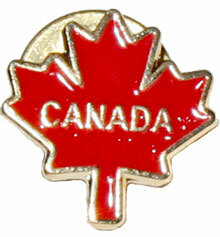 and collegues with this ½" diameter Canadian-made pin. The products on our website are constantly updated and as current as possible. Occasionally our supply of particular prints/designs are not available at certain times. Please be assured, the quality of a substituted product is equal to, if not better, than the one shown on the website. Thank you for shopping with O’Canada Gear.